While cheap pizzas from Pizza Hut, Domino's, and Papa John's all have subtle differences that make them unique, what truly distinguishes the fast-food pizza giants is what comes on the side with your pie. Pizza Hut has great breadsticks, Domino's has Stuffed Cheesy Bread, and Papa John's has an array of sauces you can get in little dipping cups tucked into the box with that pepperoncini thing. And the best Papa John's sauce -- by far -- is its iconic Garlic Sauce. Papa John's knows this and on Wednesday, the chain announced that -- for the first time ever -- it will start selling limited edition, 1-gallon jugs of the beloved dipping sauce this week. 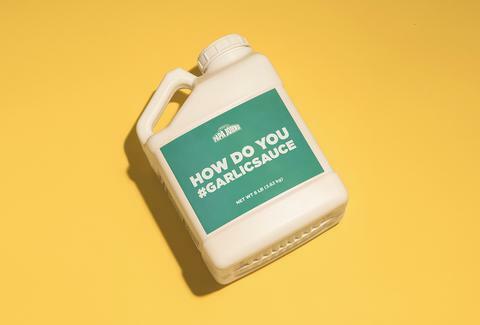 Instead of being limited to a little cup's worth of the liquid garlic, you'll soon have enough to incorporate it into other foods without restraint. As a Papa John's spokesperson put it, you can keep it on hand for slices of pepperoni pizza or "whatever else you like to douse in a golden bath of deliciousness (no judgment)." Maybe just make sure there aren't any hidden cameras rolling first. The jugs will be available for a limited time, starting on Friday, May 11, for $20 each. Papa John's said you can get them in "select markets" through the company's garlic sauce merch store at papajohns.fooji.com (as of this writing, the store is not live yet). Until then, you have plenty of time to get some pizza and breadsticks ready. Tony Merevick is Senior News Editor at Thrillist and distinctly remembers eating lots of this stuff as a kid. Send news tips to news@thrillist.com and follow him on Twitter @tonymerevick.